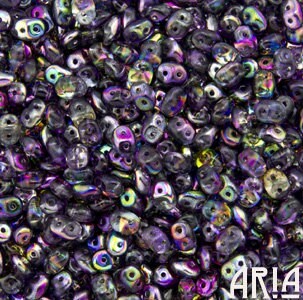 Description: SuperDuo beads are an innovative two hole seed bead that is revolutionizing beadwork designs. Similar in shape to the Twin bead, but with a few critical differences. SuperDuos are slightly larger than Twins, have a small "bump" in the center and are pressed. The SuperDuo beads are great for designs that require precision and uniformity such as in peyote stitch. The sample bangles shown are made with SuperDuo beads (not included with your purchase) was created with right angle weave and peyote stitch. For a solid colored bangle you will need approximately 4.5 packs (or 45 grams). The center bangle uses three colors and the top bangle uses two colors of SuperDuo beads. There is no need to "cull" (sort) beads like with the Twins, so there is absolutely no waste. Two hole beads, like Twins or SuperDuos, allow you to create interesting designs when combined with traditional shaped seed beads thus multiplying your design options. You can use SuperDuo and Twin beads interchangeably in bead patterns to expand your color palette. These beads are not coated crystal or black glass like Twins but actual colored glass with many coating options: Transparent, Opaque, Matte, Gold Lined, Silver Lined, Copper Lined, Color Lined, Picasso, Travertine, Luster, Celsian, Vega, AB Coating, Magic Line and other specialty coatings. These are AUTHENTIC SuperDuo beads. Be aware of fake SuperDuo beads in the market. If there is no bump between the holes, it's a fake imitation. We only offer authentic SuperDuo beads in our shop. Such a gorgeous color of superduos. Beautiful Beads! Fast shipping, great prices! Can't wait to get started using these beads! !